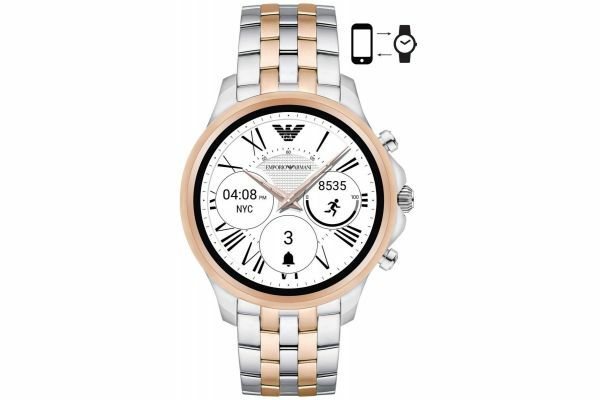 Brought to you by renowned fashion designer Emporio Armani comes this vibrant collection of Connected Touchscreen smartwatches; a conglomeration of striking aesthetic and modern technology enveloped in the most coveted of wearable design. The Emporio Armani Connected Touchscreen smartwatches are compatible with both iOS® and Android™ phones, and are powered by Android Wear™ 2.0, Google's smartwatch platform, and the Qualcomm® Snapdragon Wear™ 2100 smartwatch platform. Keep up to date with all your messages and notifications delivered from your phone straight to your watch; connect with your favourite apps to further personalise your Connected Touchscreen watch. Track your activity; access your music and receive all your notifications without the need of looking at your phone. The Armani Connected watches can be further customised with an array of interchangeable straps and downloadable dial designs; change your watch to suit any occasion. This striking men’s smartwatch features a 46mm round case in which houses the Touchscreen digital display and is protected by mineral glass. With its bold two-tone rose gold plated stainless steel design this alluring watch is simple to style and customise. Secured by a fold over push deployment the Armani Connected watch is both sporty and formal in style. Water resistant up to 10 meters and powered by a rechargeable quartz movement the Connected Touchscreen is bursting with handy features and downloadable apps. The perfect timepiece for the tech savvy or those who just want to make life a little easier; the Emporio Armani Connected Touchscreen smartwatch makes for the ideal gift for yourself or someone close. An array of dial styles are available to download and personalise your watch to suit your mood and occasion; simply swipe left or right to change your dial; an effortless way to add flair to your timepiece. Keep track of your daily fitness or record those high intensity workouts; the Armani Connected Touchscreen automatically tracks your steps walked, distance travelled and the calories burned; sync with your preferred fitness app to observe your goals and progress. With a simple tap and swipe, access your personalised music library. Stay in the know with instant notifications; reply to texts with preset responses or simply be reminded of an important email; the Armani Connected Touchscreen watch can be personalised with your preferred app notifications. With Google Assist you can use voice commands to set alerts, notifications and search the internet by simply speaking with the Google Assist app; an easy and impressive way to get those answers you need or a quick translation without needing a laptop or your phone. Using either the Google Play Store or the Android Wear App on your smartphone you can download and access all of your favourite apps onto your Armani Connected Touchscreen Smartwatch. Alter the design of your watch is suit your mood or occasion with interchangeable silicone, leather and stainless-steel straps. The watch is Bluetooth enabled and is compatible with Android™ OS 4.3+, iPhone 5+/iOS 9+. It has a 4GB hard drive, 512MB RAM and a Qualcomm Snapdragon Wear 2100 processor. It has the following sensors: accelerometer, gyroscope and ambient light. For us to size your new Emporio Armani Connected Touchscreen watch as accurately as possible, please take a look at our downloadable Watch Sizing Guide.